Aquatic flowers, plants that grow in or on the water, are becoming more and more popular as an increasing number of people delve into the arena of water gardening. Creating a pond in your backyard not only sets your garden aside from others around it, but effectively creates a centerpiece for your yard around which the rest of the property can be designed. There' nothing quite like sitting next to a peaceful pond after a hard day' work, especially if you built it yourself. The sense of pride will guarantee you'll feel good whenever you walk past. 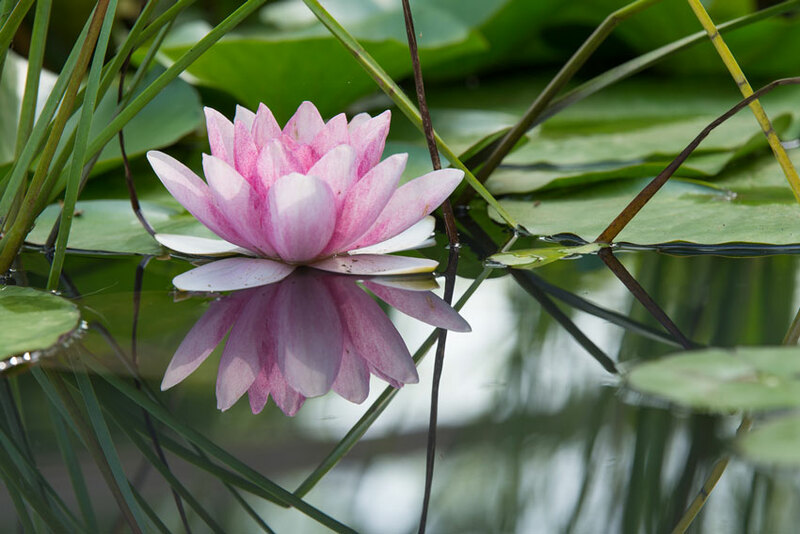 If you're planning a pond or water garden, it' important to learn about aquatic flowers – namely, which varieties of aquatic flowers are suitable for your climate, your budget, and your overall goals. Aquatic flowers come in a few different varieties, based on size, appearance, and the nature of how they grow. When you compare lily pads to a bulrush, for example, you can see the difference straight away. Combining the different varieties leads to a unique and healthy garden that will please you and your entire family. It will also create a diverse ecosystem friendly to all sorts of beneficial critters, and their delivery into your yard will be entirely beneficial. Here we've listed some of the common aquatic flowers to include in your pond. Maintain a good mixture and you'll ensure the maximum potential health of your backyard' ecosystem. The water lily is the classic lily pad associated with ponds and frogs. These aquatic flowers are an absolute must for any successful pond garden. Not only do they provide blossoms for a lengthy period of time, but they also spread shade in the water. This cuts down on algae, which requires sun to grow, and keeps the water clean and clear. Make sure to remove old flowers and leaves every few weeks, as this will encourage healthy growth. These are a smaller variant of the above, and suitable for smaller ponds of tub-based gardens. They take up less space will still providing shelter for frogs and fish, and while still producing pleasant aquatic flowers to look at. These are small yellow aquatic flowers with bright green leaves. They are common throughout the late spring and summertime, and are perfect for placement amongst lilies due to their unobtrusive size. They require a good amount of sun to remain fresh and healthy. This variety of the hawthorn plant produces fragrant white flowers with a black center in late winter and during the spring, and has bright green floating leaves for the rest of the year. They can tolerate a bit of shade, if needed, but should still have access to some sun for best results. These aquatic flowers are also great to mix with lilies because they can grow up between them. Duckweed is a floating plant that is a great addition to any pond that will have fish living in it. It provides peaceful shelter for them, and is also a great source of food for larger types of fish. This floating plant resembles a head of lettuce. Don't include it if you live in a climate with high chances of spring frost, as this will damage and often kill the water lettuce. The Japanese iris can grow to three feet in height, and produces purple, white or dark red blossoms in November and December. These aquatic flowers require a lot of sun to thrive. This plant sports heart-shaped leaves and pleasant creamy-white flowers in the summertime. It grows best with access to the sun. The water cress enjoys a quick growth period, and displays attractive small white flowers. These aquatic flowers need sun to remain healthy. Of interest – water cress can be eaten, is a popular healthy ingredient in many leafy salads. The above aquatic flowers and plants, when combined, will produce a truly enviable and enjoyable pond or water garden. Be sure to find out the best methods for planting each variety, including optimal soil composition, required ratio of sun to shade, and any other information that might be critical. You'll enjoy nature' gifts as they flourish in your garden, and will provide new homes for local animals at the same time.